Taylor Hidalgo considers his car as a meditation chamber. At various times in my life, I find myself alone in my car, with long expanses of road ahead of and behind me. Many of these trips are in darkness, persisting long after the bleary AM hours descend over the highway. As someone who wrestles with social anxiety and depression, I find a push-and-pull in the solitary drive that is both relaxing and awful. Being free of the perception of constant judgment and able to speak, think, and behave in any way that captures my whimsy is incredibly freeing and a worthwhile way to while the hours away as I put miles of Earth behind me. On the other hand, though, the hours are left to the mental gremlins which haunt my late hours. Despite absolute certainty that any long drive will earn me a bit of personal suffering, there is something enthralling about road trips that somehow never feels entirely soured by my gremlins’ furious effort. The first few hours of any road trip feel daunting, but more than a little magical as well. An entire world seems to shrink to the size of my car’s interior, the climate and music shaped by my will, and I have something akin to an out-of-body experience as my consciousness joins with the gentle rumble of metal and plastic that surrounds me. As much as I love them, videogames have never felt real to me. Even when I’m leaning into an experience, I’m still conscious of how the couch feels beneath me, or whether or not my legs are comfortable as I’m sitting. I can feel the arch of my back, the temperature in the room, and the distinct frustrations as my effort to move my on-screen avatar is limited by a control scheme that only approximates my intent. In life, I could break into homes just to watch TV, say rude things unprovoked, and use my bodyparts as chew toys at a whim. I rarely do, in part because of the aforementioned anxiety, but I’m constantly aware it’s possible. In games, it is literally and physically impossible to do any of those things. As simulations, games are only approximately accurate. Driving games—particularly open world driving sandboxes—don’t have that issue for me. As I lean back in my chair, I feel something akin to the familiar disconnect of a long, dark stretch of highway. As if driving through the dead of night, my sense of the world around me dulls slightly as I project a part of my conscious onto the car and the constraints of the road. Although I’m perfectly capable of lancing my little car into a concrete barrier and causing thousands of dollars of damage when I’m out on the highway, I still internalize the rules as if they were absolute. In driving games, the same rules I make for myself are mirrored by the games’ systems. 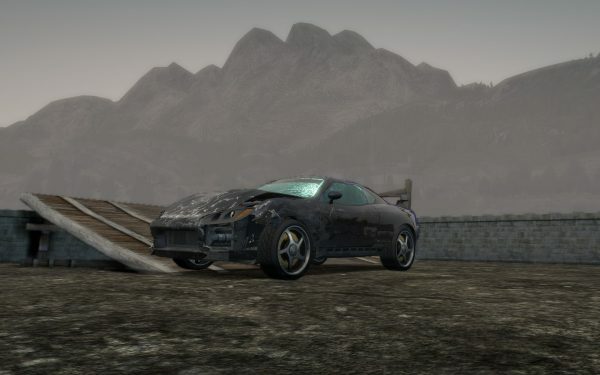 When I sit down with the big cities and empty streets of Burnout Paradise and Need for Speed: Most Wanted, I find myself returning to a meditative state, in which I can let the miles pass in that familiar out-of-body experience. Along with the soft hum of the tires comes the same blissful mindscape I feel in the preliminary hours of a road trip. I shuffle slightly in my metaphorical driver’s seat, and see the small, accidental movements reflected almost imperceptibly in my car’s actions as well. I am both myself and this car, and I am alone in this world, surrounded by traffic, content for a few hours to be a part of the ebbs and flows of the road. The dark thoughts that serve as my passengers in the real world never come to me among the digital roadways and yellow-orange cones of simulated street lights. Instead, I stay in a constant state of semi-real awareness and detachment. The parts of me with doubts, self-loathing, uncertainty, and anxious judgment fade from my mind. Darkness settles over the marble and glass towers that make up the unreal city, painting blanched-white parking garages in dark blues and purples. For a while, the radio and the soft glow of headlights and tail lights are all there is. The stated objectives in sandbox driving games games—like unlocking upgrades, acquiring new cars, winning races, and becoming the highest scoring player in the online leaderboards—feel so secondary to the actual experience of driving that I often have to convince myself to continue pursuing them once I’ve found a car I genuinely enjoy driving or a particularly scenic section of city to park, set the brake, and just internalize the moment. The eastern range of mountains in Most Wanted are beautiful, with trees and grass perched atop the ragged rocks of the mountaintops. My journey as the player-car is so much more about the feel of driving than any goal I’m meant to achieve. The sunrise I can see climbing over the far off horizon feels so much more valuable than whatever engine tweaks, upgraded racing brake pads, and gold medal is promised by the top of the scoreboards. Perhaps what keeps the gremlins at bay in the digital world is the ease with which I can just park my car anywhere. During the long hours belted to my chair with my fingers stiff around the steering wheel, every hour feels as long as the two that came before it. It feels unending. At no point can I just pull over, step out, and be free of whatever miles still lie ahead. No matter what, I will have to finish the trip. 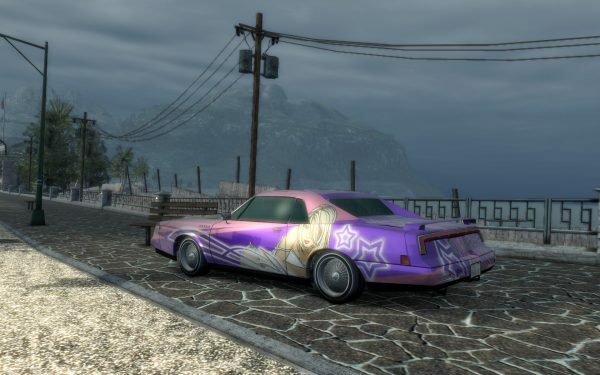 In games, I can just park, turn off the game, and find myself back in my own world, wholly independent of the apparently endless thoroughfare. And, should I choose to, driving wherever catches my attention costs me nothing. I may find myself somewhere new, equally beautiful, and no more than seconds from wherever my responsibilities actually are. Whatever the cause, I find driving games to be a source of endless contentment. Perhaps not all at once, like an addiction to be fed and fed but never sated, but a familiar calm like returning to a childhood snack or the blissful emptiness found in deep meditation. A quiet moment perfectly poised among the roar of engines, thrum of tires, and the occasional sputtering of tailpipes as the automatic gearbox thrusts me faster into the horizon. These moments are beautiful, almost too perfect, and too easily lost. But not for a little while, and perhaps the coming sunset will be beautiful wherever my wheels find themselves when the time comes. Taylor Hidalgo is a writer, editor, and Features Editor here at Haywire. He’s a fan of the sound of language, the sounds of games, and the sound of deadlines looming nearby. He sometimes says things on Twitter, his website, and has a Patreon if that’s your thing. Haywire Magazine is a bi-monthly games culture webzine turned blog collective. We aim to offer a shared space for critics outside the traditional publishing system. No entrance requirements, just throw your ideas at us and we'll help you get them written up and out there. For more information, have a look at our ethics statement.